Man I was tired today, but I couldn't let a whole Sunday go by without doing something. 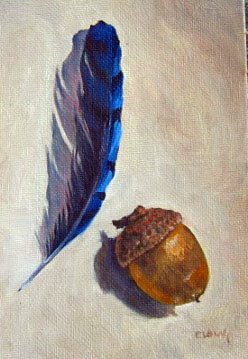 A 4x6 ...I'm just facinated by the color in these blue jay feathers. It was strange how the feather was blue-black yet cast a pink hued shadow. I love these feathers...hopefully I'll find more. Thanks for stopping in and commenting. As soon as I saw that spelling of 'color' I knew it was you. I'm pleased that you like my bluejay feathers.